Der CF1-Adapter ermöglicht es, über einen PCMCI-Slot Daten auf einer CF-Karte zu speichern und auszulesen. Das gilt z.B. für PCs, den CR5000 Logger, den CR9000X und das CR9080 Modul für unsere CR9000-Logger. 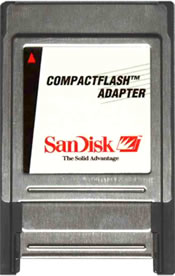 Besides being compatible with our data loggers, the CF1 fits into the PCMCIA slot on a computer allowing the computer to read CompactFlash cards. One Type I or Type II CF card fits in the module's slot. Campbell Scientific offers and recommends several CF cards (see Ordering tab). These cards have passed Campbell Scientific's ESD testing and operate properly with our data loggers.